No more money was supposedly available to resolve the nurses dispute. 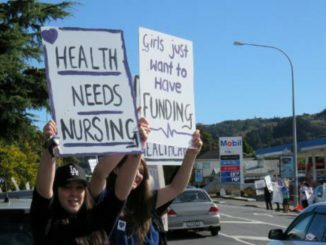 Yet in the wake of industrial action taken by the nurses, another $38 million has been found to enable DHBs to start recruiting further staff immediately, and to deploy them into areas of greatest need. The other new cost element (in the revised package intended to resolve the current dispute) provides for a new pay step at the top end of the scale for registered nurses and midwives, and this will take effect in May 2020. In almost every other respect, the package that nurses are voting on this week looks virtually identical to the four previous incarnations of the DHBs offer that have been rejected. To many nurses, the current offers on pay and conditions still fail to adequately address the long-festering problems in pay and staffing facing the sector. For its part, the government will be crossing its fingers that this week’s ballot will remove the nurses dispute from the political calendar, because the teachers dispute over their pay and work conditions is fast coming down the pike, with an all-day strike action announced for August 15. Earlier this week, I asked Acting PM Winston Peters what lessons the teachers could take from the course of the nurses’ industrial action. In reply, Peters said that the government was in the process of forging a new compact for the provision of social services. “But if people take the narrow point of view that they will somehow, prevail upon the government, thinking that we come from a position of weakness, then that would be a terrible mistake.” Right. But couldn’t the teachers conclude that industrial action is what enabled the nurses to get the DHBs’ full attention, and proceed likewise? “That would be a mistake,” Peters replied. If anything, the teachers are an even better organized body, and are better resourced in all ways to pursue the outcomes they week. If the Minister of Health and his review is going to lead to something positively transformational, it needs to steer away from structural change. Instead, it should focus on improving clinically-led networking processes between community and hospital, and between DHBs at all levels, on explicitly directing DHBs to be enabling workforce empowerment (distributed clinical leadership for much of what they are responsible for), and explicitly requiring DHBs to be responsible for the health and well-being of their workforce. To the ASMS, a structural solution would be disruptive in costly, and negative, ways. To the nurses, this ongoing review could well end up imposing even further stresses on the delivery of their care. Moreover, the costs of implementation will once again make a mockery of the alleged lack of extra money available to meet the current, pressing needs of nurses and midwives. Because whatever changes Heather Simpson and her review team end up recommending, it’s a pretty safe bet that a Labour-led coalition will treat money as no object when it comes down to putting Simpson’s findings into practice. Typical, really. The unhappy legacy of the past nine years of health underfunding has been to create a destructive zero/sum game – whereby for every part of the public health system that gains, another pressing need goes unmet. As a consequence, it is easy to see why the nurses and midwives might decide this week that it is now or never for their sector, and vote “No” again to the latest rejig. The resentments seem likely to linger, either way. For a workforce facing burnout, it seems ironic that the deciding factor in their dispute may well come down not to the fairness of the offer, but to how many nurses and midwives have burned out en route, during the struggle to achieve what they deserve. What a surprise. The same guy (Emerson Mnangagwa) who rigged elections for Robert Mugabe for decades, is now the country’s President. Yet it is being claimed that this week’s elections (that apparently, have confirmed his Zanu-PF party in power) may also have been rigged. Surely not. Surely ZANU-PF and its cronies who have milked the country dry for the past 35 years would have gracefully bowed to the peoples will, if the vote had not gone their way. The international monitors have already condemned the poll. Can there be any job in politics less rewarding than being Leader of the Opposition in Zimbabwe? In a similar scam, US President Donald Trump is offering to talk with Iran. It has been interesting to watch the media attempt to contextualise this offer – by (misleadingly) likening it to the pattern of Trumpian threats followed by cosying up that we saw with respect to North Korea. That analogy is false. North Korea had been isolated, and had much to gain from colluding in the Singapore charade. The Iranians have nothing to gain. Iranian PM Hassan Rouhani sat down before with the Americans and signed a deal with them – at great personal risk, given the criticism he faced at home for making concessions to the Americans. Even though Iran kept its side of the deal, the Americans didn’t. So why on earth would Rouhani sit down again and talk with a country that doesn’t honour its commitments? It’s a farce, on every level. Moments after Trump claimed there would be no pre-conditions for such talks, Secretary of State Mike Pompeo trotted out a list of pre-conditions. Just one more occasion for the media to re-broadcast the US propaganda line that Iran is the world’s main exporter of terrorism. It isn’t, by a long shot. For the past two decades, that title has belonged to America’s key ally, Saudi Arabia, which is currently engaged in causing the world’s worst humanitarian catastrophe, in Yemen. The lazy media take? That Yemen is a proxy war between the Saudis and Iran. It isn’t. Iran’s minimal support for the Houthi rebels has been insignificant compared to what the Saudis are doing to bomb and starve Yemeni civilians into submission. At the same time, the Saudis have embargoed the flow of medical supplies needed to treat the cholera epidemic they have created in Yemen. Internally, the economy of Iran is seriously deteriorating. But what plan, if any, does the US and the rest of the world have, if economic sanctions end up causing the Iranian regime to collapse? In the past two years, New Zealand has built up some important trade links with Iran. It looks like it will now tamely surrender them. The first round of US sanctions officially commence on August 7th, and the Americans will enforce secondary sanctions on any country that dares to defy its total freeze on trading with Iran, come November 4th. So far, Foreign Minister Winston Peters – a lion at home, a lamb abroad – has said nothing about this shakedown.